This page is a permanent work in progress. Last modified 27 August 2018. A mechanical pencil is an implement for writing or drawing in which the solid marking core (usually graphite based and called lead, but coloured pigments and other solid substances are also used) is not bonded to the outer casing, and is designed such that the lead is to be extended as its point is worn away. Pencil lead is the stick of solid pigment that is the marking material of a pencil. Pencils are distinct from pens and other markers which use a liquid marking material. Multi function pens and other combination implements may include a component that is of itself a mechanical pencil, and thus they are mechanical pencils, as well as being something else. 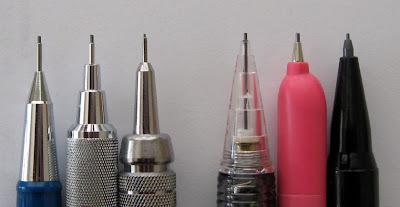 Pop-A-Point (push-point) and similar pencils are not mechanical pencils as they have no mechanism that allows the lead to be extended, it is simply replaced. A mechanical pencil is a writing or drawing implement, thus mechanical pencil-like items that have a cosmetic product, medical product, metal pointer, eraser core, etc in place of pencil lead and that are intended primarily for non-writing or drawing purposes are not mechanical pencils. Mechanical pencils are often designed and used to provide lines of constant thickness without requiring sharpening, making them well suited to applications like technical drawing and general writing. Mechanical pencils are known by many alternative names, some of the most common alternatives being propelling pencil, automatic pencil, drafting pencil, technical pencil, clicky pencil, lead or led pencil, clutch pencil and leadholder. The term mechanical pencil is generally of American English origin. The term propelling pencil was dominant in Commonwealth English until the later part of the 20th century when it's use gradually declined. Today the term mechanical pencil is used almost universally to the exclusion of other terms by writing instrument manufacturers and online retailers, but it is less dominant in other situations. The WCO (World Customs Organization) maintains the international Harmonized Commodity Description and Coding System (HS) (often called the Harmonized System or Harmonized Tariff Schedule) which is used by the vast majority of countries to control and classify traded goods. The Harmonized Tariff Schedule places mechanical pencils in chapter 9608.40 “Propelling or sliding pencils” so propelling pencil or sliding pencil is the official designation for a mechanical pencil as formally agreed by international treaty amongst the majority of governments of the world. Notably the United States Harmonized Tariff Schedule places mechanical pencils in 9608.40 “Propelling or sliding pencils (for example, mechanical pencils)”. The Harmonized System prohibits countries from renaming sections, but the US have added an explanatory example in their tariff schedule. The earliest known example of a graphite pencil is the one described by Swiss naturalist Conrad Gessner in “De Rerum Fossilium Lapidum et Gemmarum Maxime, Figuris et Similitudinibus Liber” published in 1565. The pencil is not described or illustrated with enough detail to decide if it meets the definition of a leadholder style mechanical pencil but it is clearly either that or a simple porte-crayon. The first patent for a refillable pencil with a lead-propelling mechanism was issued to Sampson Mordan and John Isaac Hawkins in Britain in 1822. After buying out Hawkins' patent rights, Mordan entered into a business partnership with Gabriel Riddle from 1823 to 1837. The earliest Mordan pencils are thus hallmarked 'SM GR'. Sampson Mordan ended the partnership with Riddle in 1837 and continued to manufacture pencils and a wide range of silver objects. His company continued on until early World War 2, when in 1941 the factory was destroyed in a bombing raid and the company ceased trading. From 1822 to 1874, more than 160 UK patents were registered pertaining to a variety of improvements to mechanical pencils. The first spring-loaded mechanical pencil was patented in 1877 and a twist-feed mechanism was developed in 1895. The mechanical pencil became commercially successful in Japan after 1915 when Tokuji Hayakawa, a metal worker who had just finished his apprenticeship designed and introduced his 'Ever-Ready Sharp Pencil'. Success was not immediate, since the metal body was unfamiliar to users. However the Ever-Sharp began selling in large numbers after a company from Yokohama made a large order. Later Tokuji Hayakawa's company got its name from that pencil: Sharp, which is still operating today. Hayakawa's factory was destroyed in the Great Kanto earthquake of 1923 and shortly afterward he sold his pencil patents and manufacturing rights to an Osaka stationery company. The word 'sharp' or 'sharp pencil' is the common name for a mechanical pencil in Japan. At nearly the same time, in the United States of America, Charles R. Keeran was developing a similar pencil that would be the precursor of most of today's pencils. Keeran and Hayakawa's two development histories are often mistakenly combined into one. Keeran's company was soon taken over by the Wahl Adding Machine Company and by the 1920's Wahl Eversharp had become a leading US and UK writing instrument manufacturer until declining with the commercialisation of the ballpoint pen in the 1950's, and being taken over by the Parker Pen Co in 1957. In the early and mid 20th century the increasing prosperity and literacy of the populations of many countries around the world provided a rapidly expanding market for writing instrument manufacturers. Mechanical pencils were popularised by fountain pen manufacturers as part of pen–pencil sets, by office supplies companies as an alternative to wooden pencils and ink pens and as an advertising aid, and by traditional wooden pencil manufacturers as a new product line for both the general public and technical users. During this period, mechanical pencil manufacturing was widespread but the USA, UK, Germany and Japan were particularly significant producers. The later part of the 20th century saw the decline of mechanical pencil manufacturing in the USA, UK and Germany but its increase in Japan, and the emergence of China and Korea as significant producers. In the early 1960's advances in pencil lead manufacturing enabled the commercially successful manufacture of much thinner leads than was previously possible. The Pentel Company of Japan began to popularize the use of thin lead (less than 0.9mm) mechanical pencils for drafting work and general writing, and in the late 1960's and early 1970's most other manufacturers followed suit as soon as they were technically capable. With these thin leads, the lead diameter is the line thickness, thus eliminating the need for frequent sharpening. The elimination of the need for sharpening led to their adoption by draftsmen in particular. By the 1980's thin lead ratchet mechanism mechanical pencils were the dominant mechanical pencil type sold commercially. Mechanical pencils can generally be divided into two basic types by mechanism - those that only hold the lead in position and those that hold and propel the lead. The first category, those mechanical pencils that only hold the lead in position, are frequently referred to as leadholders or clutch pencils. Leadholders or clutch pencils typically use a thicker piece of lead (commonly 2 mm, but many other sizes are also used e.g. 3.15mm and 5.6mm) and have a set of jaws that clamp the lead at the tip. The jaws are typically opened by pressing down the top cap which in turn allows the lead to freely drop through the barrel. They can typically only carry one whole stick of lead at a time. Somewhat confusingly the term leadholder is also often used for any thicker lead mechanical pencil irrespective of its mechanism type. Similarly to woodcase pencils, the thick leads of leadholders generally require frequent sharpening by the user to enable fine lines to be drawn. Ratchet-based pencils, in which the lead is advanced by the mechanism in small incremental amounts. This became the dominant mechanism by the mid-1970's and remains so today. The incremental advance is typically a fixed amount but some mechanisms allow the user to vary the length of the increment. There are many methods of activating the mechanism but a push button on the top or side of the pencil is the most common. Other methods include a weight inside the body of the pencil which operates the mechanism when the pencil is shaken back and forth, a cam activator operated when a part of the body is twisted round (it then springs back), and a push rod or other system which activates the mechanism when the pencil body is bent. All these mechanisms are essentially the same; it is only the method of mechanical activation that varies. Another variation of the ratchet-based pencil is automatic lead advance. In this design the lead is automatically advanced when it is worn away and the tip of the pencil touches the surface being written or drawn upon. Some ratchet mechanism pencils utilize more than one method of activating the lead advance mechanism. Screw-based pencils, in which the lead is advanced by twisting a screw mechanism. Typically some part of the upper body or the pencil tip serves as the part of the mechanism that is wound around to move the lead. The lead is advanced continuously by the screw thread, it is not advanced in increments like ratchet mechanisms. This was the most common type of hold and propel mechanism in the earlier part of the twentieth century. With both ratchet and screw mechanisms, some designs allow the lead to only be advanced and some allow it to be advanced and retracted. Most mechanical pencils can be refilled with more lead of the same size but some less-expensive models are not refillable and intended to be disposable. Many mechanisms also include additional features such as spring cushioning or other means to reduce lead breakage, lead usage enhancers to reduce the residual length of the stick of lead that cannot be advanced by the mechanism and used for writing, and even automatic lead rotation features to stop a chisel-edge forming on the lead. Most mechanical pencils can be divided into two basic classes by intended use - those that are intended for general writing or artistic purposes, and those that are intended for technical drawing or drafting purposes. There is much cross-over between these two classes, particularly as virtually all technical drawing mechanical pencils can be used for general writing, but nevertheless there are some clear distinctions between general writing and technical pencils. The most obvious distinction is that thin lead technical pencils have a long (3-5 mm) thin cylindrical lead sleeve that allows the pencil tip to be run along a ruler edge or other such guide. Precision and rigidity are important for drafting purposes so the lead sleeve is frequently fixed permanently in position, although many retractable models do exist. In contrast the lead sleeves of general writing pencils have no such restraint and are often short and conical, and rigidity is of less importance. Leadholders that use thick leads do not generally have a sleeve as the lead is of sufficient strength and rigidity to eliminate the need for one. General writing pencils have a wide variety of grips, often triangular or otherwise ergonomically shaped whereas technical pencils generally have essentially plain non-contoured grips allowing the pencil to be held and rotated at any position. Whilst most mechanical pencils can be divided as above, a small number of mechanical pencils designed for other specialist applications fit neither class, for example some carpenter pencils. Up until the 1960’s leads for mechanical pencils were of essentially the same formulation as that used in wooden pencils, i.e. primarily a mixture of graphite and clay. Leads were initially of any size any manufacturer felt suitable. In the early 20th century the popularity of Wahl Eversharp pencils meant that by about 1916 the common industry standard lead size for general writing pencils had become .046” or 1.18mm diameter (often called 1.1mm or 1.2mm). In the late 1930’s .036” or 0.9mm diameter leads were introduced and this size soon too became an industry standard. Throughout this period the common lead size for technical drawing leadholders remained 2mm, and the lead was sharpened by the user to the desired point thickness. In the late 1960’s and 1970’s polymer based leads became commercially widely available. The use of polymers instead of ceramic clay as the binding agent increased the strength of the leads and allowed the successful introduction of thinner lead diameters such as 0.7mm, 0.5mm, and 0.3mm. Today leads of 1.18mm or thicker are typically of a traditional ceramic based composition and those less than 1.18mm diameter are typically polymer based. Leads are typically round in cross-section but square, rectangular and other cross-section shapes have also been used, both for specific purposes such as marking out materials to be cut, and for general writing as an alternative to the usual round leads. The choice of lead thickness depends largely on the users' preferences. 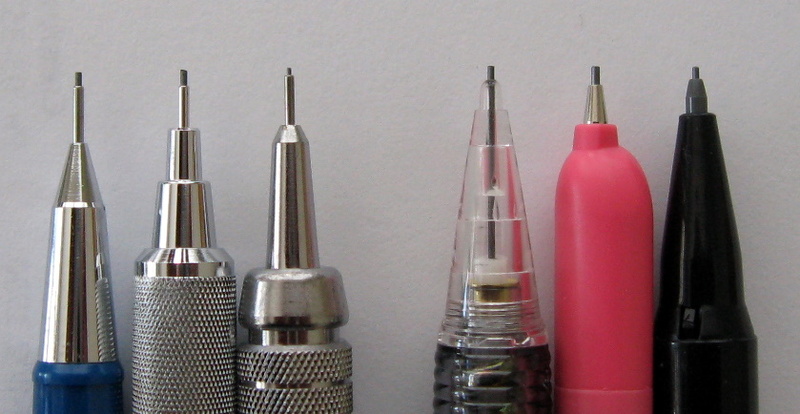 Generally, the most commonly used lead sizes for mechanical pencils are 0.5mm and 0.7mm. By using such widths, most users will produce a distinct line, allowing sharp writing and drawing without the need for sharpening. Many other sizes are also in use today or have been used in the past. There is a tendency in many Asian countries to choose, on average, thinner lead sizes than in Western countries because leads such as 0.3mm and 0.5mm are suited to writing small Chinese characters and other logograms. Like wooden pencils, graphite leads for mechanical pencils are generally available in a range of hardness grades, although the range of grades is usually less than with wooden pencils. Similarly the coloured leads readily available for mechanical pencils are a very limited colour range compared to that available in wooden pencils. As with wooden pencils, other specialist lead types such as graphite leads optimised for use on clear drawing film, and copying leads, are or have been available. Copying leads for mechanical pencils were used mainly in the early and mid 20th century not only for their copying ability but also because they were substantially indelible or non-erasable. In the early part of the 21st century, consideration of the environmental impacts of manufacturing processes became increasingly significant in the purchase decision making process of many consumers. Writing instruments were not exempt from this market force and many manufacturers began to offer products that claimed a less detrimental impact on the environment, for example by reducing power consumption and waste during manufacture, and by using recycled, recyclable or renewable raw materials. Mechanical pencils and traditional wooden pencils were sometimes both cast as environmentally friendly alternatives, both to each other, as well as to other writing instruments. 1. "Sampson Mordan Pencils". Mark Hill Collects: The 20th Century Design and Collectibles Blog. 2009-04-30. http://markhillcollects.blogspot.com/2009/04/sampson-mordan-pencils.html. Retrieved 2010-07-10. 2. "Sharp Corporation". Hayakawa Ever-Sharp Pencil. http://sharp-world.com/corporate/info/his/h_company/1915_1919/index.html. Retrieved 2010-07-10. 3. "Keeran's Eversharp & Hayakawa's Ever-Ready Sharp". http://www.vintagepens.com/Eversharp_history.htm. Retrieved 2010-07-11. 1. A timeline of the introduction of 0.5mm leads and mechanical pencils. This article originally drew extensively on the English language Wikipedia article Mechanical Pencil which I have contributed to. Constructive comments and suggestions on this article are welcomed. However, after due consideration and relevant discussion they will be deleted.